Creative jewelry for men and women. Funky rings and unique cufflinks all made in USA with crushed glass fused into clay pieces, and finished with sterling silver findings. Paloma's artisans have labored to combine popular shapes, colors and sizes. Producing a modern, and yet timeless collection - we have something that will drape well on anyone. 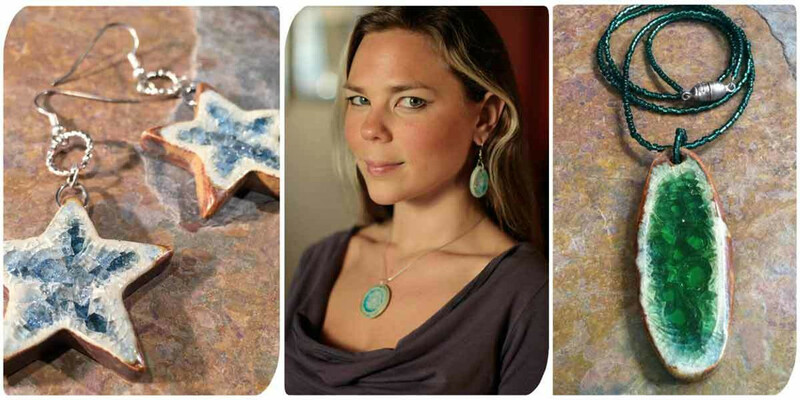 Recycled glass necklaces and pendants in shapes both bold & whimsical. Funky big rings that are sure to spark a conversation. Lapel pins that sparkle in the light. Crushed glass, heat, and pottery... Fused into a unique one of a kind piece. What remains are elegant tokens of love and commitment in this creative, eco-friendly jewelry line. Our earth-friendly jewellery accessories line will also help you keep organized. Hang your necklaces on our novelty wall hooks, keep your precious jewels safe with our unique ring holders.